Don and Sally were fifteen minutes late. I wasn’t annoyed by this, my anglers show up late all the time, but I found it kind of surprising since I knew how eager Don and his wife were for their trip. We were going after tarpon this morning and the conditions were perfect. We had a cloudless sky, no wind and a tide that just started rising a half hour earlier. It was the complete opposite of the morning we had just a month earlier. Our first charter together happened right after a nasty March cold front with twenty knot winds and churned up flats that made sight casting almost impossible. I fought a constant battle to keep the skiff in a decent casting position and Don still managed to land a nice legal-sized redfish on a fly early that morning. Sally followed up with one of her own on spinning gear just before lunch. They were the first new clients I’d fished with in a long time and we were off to a good start. They were also that perfect combination of skilled anglers who were easy to deal with on a tough day, so I was more than happy when Don started talking about booking a tarpon trip with me in early April. Over the next three weeks I fielded nearly a dozen phone calls and e-mails from Don about flies, fly lines, leaders, and hook sizes. Believe it or not, I actually like getting calls at dinnertime from my clients asking me questions such as “Should I use rabbit fur or marabou in these Tarpon Toads I’m tying?” I take that as a sign of a serious angler, and Don was definitely serious. That’s why I found his slight tardiness that morning kind of puzzling, but he and Sally were willing to drive all the up from Estero to fish with me again so I let it slide. It was still a few minutes before 8AM when we finally motored away from the dock. There was still plenty of morning left for us. Matlacha Pass was flat calm and the run to Charlotte Harbor took no time at all. The water up there was gin clear and 76 degrees, perfect conditions to find some big tarpon. I aimed my Beavertail skiff west and we pressed on until the shoreline of Gasparilla came into view. A few minutes later we were approaching the shallows of my favorite tarpon spot. Just as I was reaching for the throttle I noticed the other boat coming from the west but aiming for the same bank. He came off plane first and idled right up to the edge of the flat. There was a lone angler driving the boat, a very expensive looking Hell’s Bay, and he immediately jumped up to the bow with a fly rod and started his trolling motor. Now I was annoyed. Someone had beaten me to my spot by less than a minute and was in position to get the first shots at every tarpon running down the flat. If Don and Sally had been on time we would have been well in front of this guy. I grumbled a bit but there was nothing to be done about it. I decided to just drop my Power Pole and let the other skiff move down the flat, silently praying that I wouldn’t witness him hook a tarpon right in front of us. I had Don step on the bow and make some practice casts until the Hell’s Bay was far enough away from me. After several minutes I picked up the anchor and started poling my Beavertail across the three foot deep sandy bottom. I kept an eye on the other boat but just a few minutes later the angler stepped off the deck and slowly motored off the flat without making a single cast. I was glad to have the stretch of water to myself but was now worried that the other angler left because no tarpon were here. It was now after 9AM and the sun was hitting the water at a perfect angle. I could see everything within 200 yards of us and a big tarpon would be as obvious as the nose on my face. I could also see the top of the Boca Grande lighthouse straight to my west. 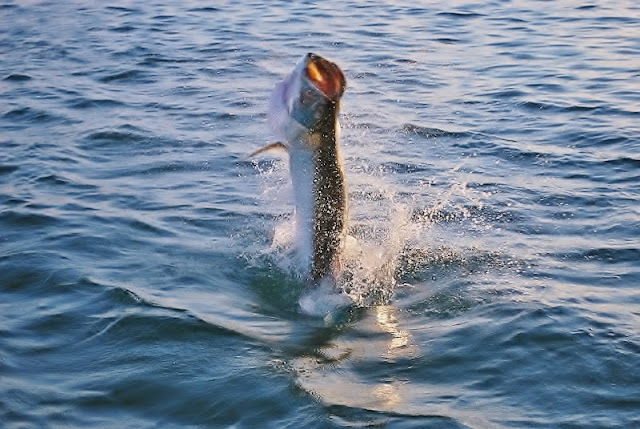 There would be hundreds, maybe thousands of tarpon pouring through the famous pass that morning. There would also be dozens of big center console boats drifting and motoring through the mile wide cut slinging live bait and heavy jigs at the mass of fish rolling in the deep water off Gasparilla. Boca Grande Pass was only a few minutes away but it was the far side of the moon as far as I was concerned. The full contact style of fishing they do out there is the polar opposite of the way I chase tarpon. I would rather get one jump on a fly rod than muscle in a dozen fish out of the depths on big conventional reels. But the way the flat seemed this morning, getting Don that one jump was looking doubtful. I quietly cursed at myself over the next few minutes for not insisting we leave a half hour earlier, convinced we already missed our short window at a tarpon. These fish are often a sunrise deal and it was now almost 9:30. That’s when I saw the black spot in the water quickly moving towards us. I spun the boat with the push pole as fast as I could to give Don a downwind shot. The fish didn’t like the sudden motion and made a quick left turn off the bright sand and into the darker grass, giving Don a lousy angle but I had him Hail Mary a cast straight off the bow to where I thought the tarpon might be heading. The purple fly became invisible once it hit the dark water and our one shot looked finished. I was just about to have Don try one more throw when the slack line from his rod tip snapped tight like a snare. We never saw the fish eat the fly but we all witnessed the aftermath. Six feet and more than one hundred pounds of brilliant silver tarpon came rocketing from the surface just twenty feet from my bow. The huge fish seemed to freeze for a moment in the air, completely out of the water and in that perfect mouth open, gills flared pose that every taxidermist loves. From the poling platform at the back of my skiff I had a fantastic view of the sparkling tarpon and several bucket’s full of spray flying through the air, with Don locked on to his heavily bowed fly rod just below me. It’s a sight I’ve witnessed countless times and still never get to see enough. The tarpon smashed back into the water a heartbeat later and it was all done. Without seeing the fish eat the fly, Don never had a chance to set the hook with the necessary violence that tarpon require. Sally was poised between us with the camera ready to capture a second jump that wasn’t going to happen. The fish disappeared as quickly as it arrived. It was our only hookup of the day. We moved on to other flats and cast to dozens of other fish but none would play our game. I wasn’t really disappointed. It was early April and tarpon season was just beginning. This time of year I often hook these fish through a combination of blind luck and being in the right place at the right time. I thought about that as we ran home at lunchtime. We were definitely in the right place that morning. And we were there at the right time because Don and Sally were fifteen minutes late. So what do you do when it's blowing a solid 15-20 knots from the NNW? Put down the fly rods, pick up the spinning gear and get as close to the mangroves as possible. The good news is that this often works, especially in Matlacha Pass when the tide is rising all morning. Hershel Avra, one of my best regular anglers, brought his neighbor's son Casey out with me yesterday and we did quite well for the conditions that were thrown at us. Hershel landed his best snook yet with a nice 27 incher and Casey's first ever sea trout was the beautiful 23 inch gator pictured above. Both fish hit Gulp shrimp rigged under sliding corks. The wind is finally supposed to lay down tomorrow and that can't happen soon enough. It's been absolutely brutal out there. If you managed to hit the water and catch some fish anywhere around Pine Island, give yourself a high five. This is a great hour-long documentary that will air again on WGCU this Wednesday, at 8PM. It documents the history of tarpon fishing and how it all began right here in our backyard over 100 years ago. Really fascinating stuff. Set your DVR and don't miss it. Actually, there's no real report here, just some nice photos from the last two days. The reds are everywhere, just toss topwaters or Gulps along the mangroves during the rising tide. Trust me, you'll catch some. Local angler Clara Pitser with her first ever redfish, a 26 inch beauty caught on a Gulp Shrimp. Clara's husband Scottie with his much, much smaller red. Scottie's redfish heading back to the water to grow up a bit. Arkansas angler Ben Ellis with a 23 inch red caught on fly near Useppa Island. 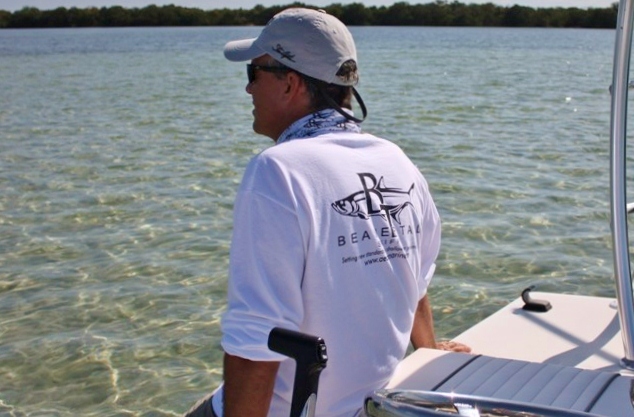 Do you own a Beavertail Skiff? Or are you like the countless millions of people across the globe who wish they did? Well here's some good news for you. The new Aeon Marine/Beavertail Skiffs store is now online. You can buy all sorts of apparel like the hats, Buffs, and shirts worn by the astoundingly handsome model in the above photo. Click here to improve your wardrobe immediately. My buddy Capt. 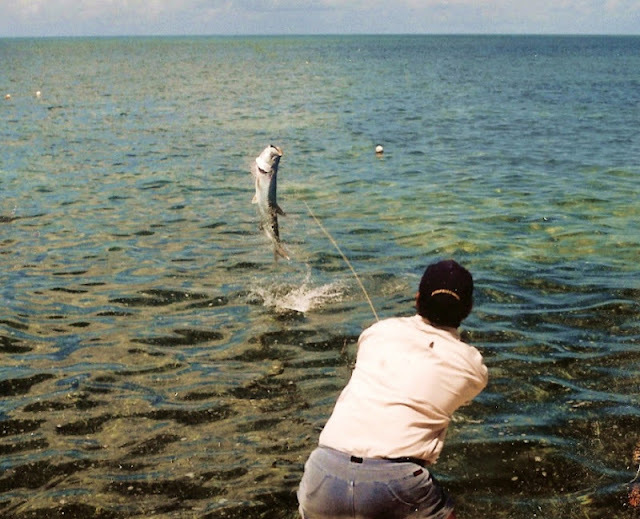 Mike Bartlett shot this excellent photo yesterday of a jumping tarpon hooked by his angler on the flats off Key West. According to Mike the tarpon have been flooding into the Lower Keys in excellent numbers so far this year and he's hooking them on flies, lures and live bait. This is also great news for us here around Pine Island since the big schools of fish that move through the Keys eventually continue their migration up the Gulf coast of Florida and wind up here about a month later. We started seeing the first trickle of big tarpon in Charlotte Harbor at the end of March and now that's turned into a steady stream of fish. The real flood will kick in for us around the end of May and continue through the summer. If you happen to be heading to the Keys right now, Capt. Mike still has a few days open this month and you can call him at 305-797-2452. 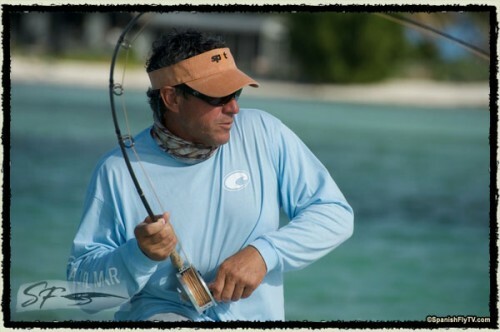 You won't find a better tarpon guide anywhere. St. James City angler Tom Larkin landed this excellent 23 1/2 inch red with me this morning on a live pinfish. There are tons of these legal sized fish running up and down the shorelines right now all over Matlacha Pass and there's not much they won't eat. April is looking really great so far. Shimano has been making the best spinning reels on the market for the last decade and their very affordable Sahara models are currently my favorite. You can pick up one of these reels for around $80 at most local tackle shops and they're a bargain at that price. The Sahara 4000 pictured above is easily the best reel you can buy for that kind of money and I'm amazed that Shimano is not charging more for it. These reels have a flawless drag and anti-reverse as well as a spool that is excellent for casting 10 to 20# braided line. Bird's nests are almost non-existent thanks to the inverted bevel on the spool's lip, an excellent design feature that every spinning reel should have. The Sahara is far from Shimano's most expensive reel. That prize goes to their Stella series which retail for around $750. Those reels are true engineering marvels and definitely worth the money. But if your bank account is like mine, the affordable Sahara is the workhorse that you'll choose. Read the details here. In addition to making "Spanish Fly," which is easily one of the best TV show's ever, Jose was a genuinely nice guy. He was one of my heroes while I was guiding down in Key West and this is a terrible loss to the fishing community. I just got this notice e-mailed to me and I'm definitely planning on going in May. 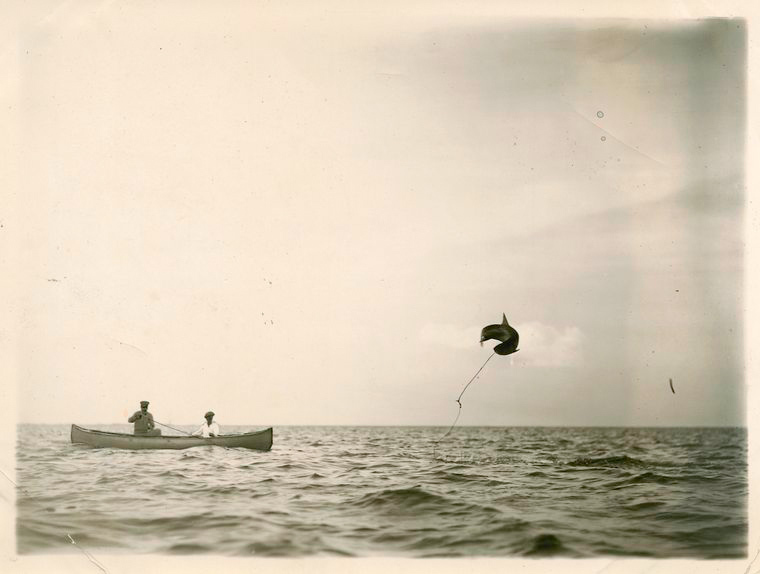 I would kill to own that shadow box full of Billy's tarpon flies in the photo below. Ever wanted to own a piece of fly-fishing history? 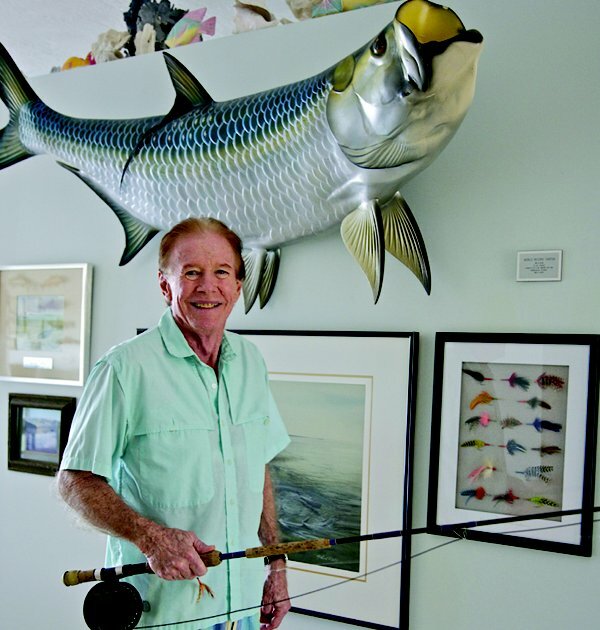 Here’s your chance: The estate of legendary saltwater fly fisherman Billy Pate is holding a public auction of his personal effects. The auction includes rods, reels and thousands of saltwater flies from his personal collection, used by Pate in his over 40-year pursuit of tarpon and billfish world records. In addition, the auction selection includes numerous pieces of original artwork from renowned artists and photographers including the late Millard Wells, Guy Harvey, Pat Ford, Val Atkinson and others. Attendees will also have the opportunity to bid on mounts of Pate’s world record catches and numerous waterfowl trophies. The auction begins at Pate’s Islamorada residence on Thursday, May 17 from 5 pm to 8 pm with an exclusive preview party of the collection benefiting Bonefish Tarpon Trust, with a $25 donation. A public preview will then be held on Friday and Saturday May 18 and 19th. The public auction will then get underway beneath a large tent kicking off at 1 pm that Saturday. For more information view our web site at www.rwolivers.com, or contact Richard W. Oliver, Auctioneer at 207-985-3600 or email rwolivers@roadrunner.com. The world famous Boca Grande Pass is a 45 minute boat ride from our dock on Matlacha but it might as well be on the dark side of the moon as far as I'm concerned. I cruised through it on a tournament weekend a few years ago just to see what it was all about and have avoided it like a case of ebola ever since. Tarpon fishing in "The Pass" is just a polar opposited to the way I like to pursue these fish. The 18 minute video below has been making the rounds for a while now and more than a few people have e-mailed it to me so I'm going to post it here. If you watch it keep in mind that it's a very well produced but one sided argument by the Boca Grande Guide's Association against the Professional Tarpon Tournament Series (PTTS.) The live bait vs. jigging in The Pass fight has been going on for a few decades now and since I don't do either I have no final opinion on this subject. However, Capt. Tommy Locke is featured prominently in this video and few guides have more experience in this fishery and are more respected so this deserves a lot of attention. Blowfish On Fly, The Ultimate Angling Challenge! Yes, this is an April Fool's joke but the joke is actually on me. I just fished twenty-eight charters in a row last month and finally had a day off to take the family out the boat and catch something for myself. Matlacha Pass was flawlessly beautiful this morning with light winds and a nice rising tide. I had plans to scout out some rolling tarpon off Bokeelia and then pick up a nice redfish to bring home for dinner. Of course none of that happened. Somehow, when it's my turn on the bow and in the most perfect conditions imaginable, everything I look forward to catching gets as scarce as a Toyota Prius in the parking lot of a Monster Truck rally. The most interesting thing I hooked all day was the blowfish that ate a rabbit fur pattern right next to my boat. I've landed plenty of these weirdos on live shrimp and Gulps but this was the first that ever hit a fly. Blowfish put up a worthless fight but when they puff up into a living softball they're kind of amusing. And before you laugh, let's see you catch one on a fly.